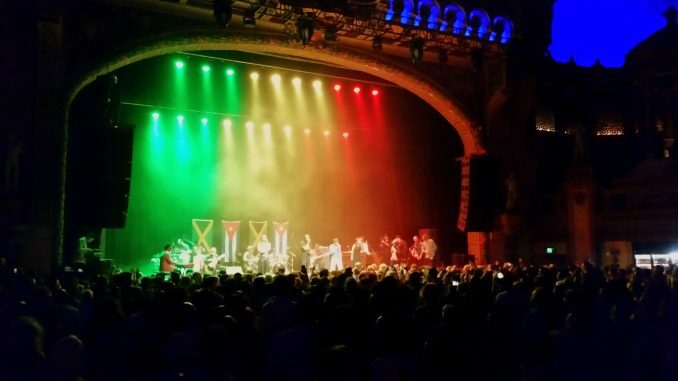 Following recent performances at WOMADELAIDE, Havana Meets Kingston fronted a full house of curious Melbourne punters ready to bust out their best moves – from reggae to rumba, grooving around salsa and son and blissfully bouncing to dancehall and dub. The brainchild of Melbourne MC Mista (Jake) Savona, a landmark album was recorded last year in Havana, Cuba. Havana Meets Kingston united Jamaicans, including Grammy winning duo and producers Sly & Robbie, with original and current Buena Vista Social Club instrumentalists to record 15 tracks at the studios where the 1999 BVSC album was made. An all-Australian killer horn section completed the 15-strong group in Melbourne. Jaunty hats and fabulous hair – both on stage and on the floor – were the look de le soir. The vibe was set to ‘balmy breeze with Savona’s DJ set. Next, local purveyors of Latin rhythms San Lazaro brought a wave of fans to their feet. Supergroup Havana Meets Kingston are a ‘family’ joined by music. “The Jamaicans don’t speak Spanish and the Cubans don’t speak English,” bandleader Savona said. Geographically only a few hundred kilometres apart, Cuba and Jamaica have plenty in common. Two island nations, where the living ain’t always easy. Yet their distinct musical traditions create a surprising cocktail. Impossibly cool, it’s as delicious as chocolate and caramel – a Caribbean dream. The delicate balance between sounds was inevitably re-calibrated after slightly off-kilter deviations. So too, the balance between high tempo celebrations and the reverence shown during fine solos. The elegant venue felt fittingly intimate despite sound that was less than great. However, there was no stopping the resounding drum and bass entering my bones in a most welcome fashion. It was a showcase of the album featuring Chan Chan’, ‘Candela’ and original ‘Carnival’. With a set list rich in classic tunes, the whole avoided a pastiche delivery. Mind you, the sight of a Barbarito Torres beaming behind his ash moustache while strumming and plucking strings behind his back, was a delight. Dance moves woven between players put my own loose moves in the shade. I’d envied the patrons ensconced in cushioned booths on my arrival. But who on Earth would want to be seated on a night like this? The encore delivered ‘Vibracion Positive’, a most satisfying take on ‘Rastaman Vibration’. Robbie Shakespeare then returned for a solo rendition of Tracy Chapman’s ‘I’m Sorry’. The players: Drummer Sly Dunbar, bassist Robbie Shakespeare, Mista Savona on keys, Barbarito Torres-Tres/Laud (CU) and Rolando Luna–Piano (CU) from the Buena Vista Social Club, Julito Padron from Irakere–Trumpets/Vocals (CU), Yaroldy Abreu from Chucho Valdes –Percussion (CU), Randy Valentine–Vocals, t-shirt (JA/UK), Brenda Navarette–Vocals/Percussion (CU), Solis–Vocals (CU), Bopee from Inna de Yard–Guitar (JA), Oliver Valdes–Percussion (CU) and supporting Australian Horn section. Pianist Luna lit up the room with astounding playing and million peso smile throughout. Valentine, sporting a ‘Still Here’ t-shirt effortlessly connected with the audience. Young, older, cool and wannabe moved to the rhythms from start to finish. Mista Savona reckons they’ve got at least one other album simmering from the project. Yes please!